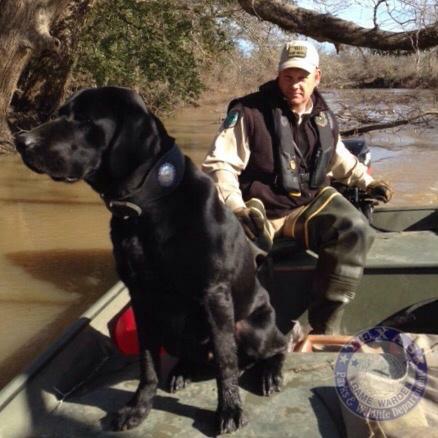 Texas Game Warden and canine partner. Texas Game Wardens are part of the communities they serve. They’re accessible and ready to answer your questions. With that in mind, our show is beginning a new feature in June called Ask a Game Warden. We’d love to hear from some of your listeners on the radio show. Grahame Jones is chief of special operations for Texas Parks and Wildlife’s Law Enforcement Division. We have a very robust social media platform, both the department’s social media and then our division’s social media as well; Facebook, Twitter, Instagram. Or submit your questions on your radio show. No matter where you are in the state, questions submitted to the radio show will receive answers, and some will be answered on the show, during our Ask a Game Warden feature. We have game wardens all over the state. Most counties have game wardens assigned to those particular counties. We have some counties in far west Texas and some counties in the panhandle that have one game warden assigned to a couple of counties. But, for the most part, we’re assigned to every country throughout the state. Submit your question at passporttotexas.org; send it via our contact page. The Texas Parks and Wildlife Foundation supports our series and helps keep Texas wild with support of proud members across the state. Find out more at tpwf.org. Since 1885, Albert Giles’ descendants have preserved the heritage of Texas through stewardship of his Hillingdon Ranch in Comfort. Biologist, Richard Heilbrun, nominated the site for a Lone Star Land Steward Award. 10— Over 97 percent of Texas is privately owned [and] managed, so without private landowners and good stewards like these folks, we don’t stand a chance in making strides toward better wildlife habitat. Four families, all descendants of original owner, Albert Giles, oversee the property: great grandson, Robin Giles. 08—I actually own 4.8 acres but we run from 14 to 18,000 acres; we have to answer to about 50 family members who are the owners. In addition to running cattle, goats and sheep on the land, they have a fiber business, and do outreach in the community. Cousin, Myrna Langford, a master naturalist, says habitat for wildlife like deer and turkey is always top of mind. 08—It is our job to see that the habitat continues to be conducive to these particular species. Giles says balance in all things is critical. 16— I think the most unique thing about the way we produce meat and fiber is also an environment for a tremendous amount of wildlife, too. It can coexist. You can make a living producing, and you can preserve the land and the wildlife. View a segment on the Giles family next week on a segment of the PBS TV Series. Check your Local listings. The Wildlife and Sport Fish Restoration Program supports our series and works to increase fishing and boating opportunities in Texas. If you plan on hunting migratory game birds in Texas this fall, you need to be HIP – HIP certified, that is. HIP stands for Harvest Information Program. 15—It’s purpose is to gain information on waterfowl and migratory bird hunters nationwide. Basically a name and address and a little bit about their previous year’s hunting activity—as well as what they plan on hunting what they plan on hunting in the upcoming year. Kevin Kraai is Waterfowl Program Leader. He says the HIP program helps wildlife professionals improve resource management practices as well as track various waterfowl populations throughout the country. 05—It’s a very useful tool in setting the future year hunting regulations and management decisions. 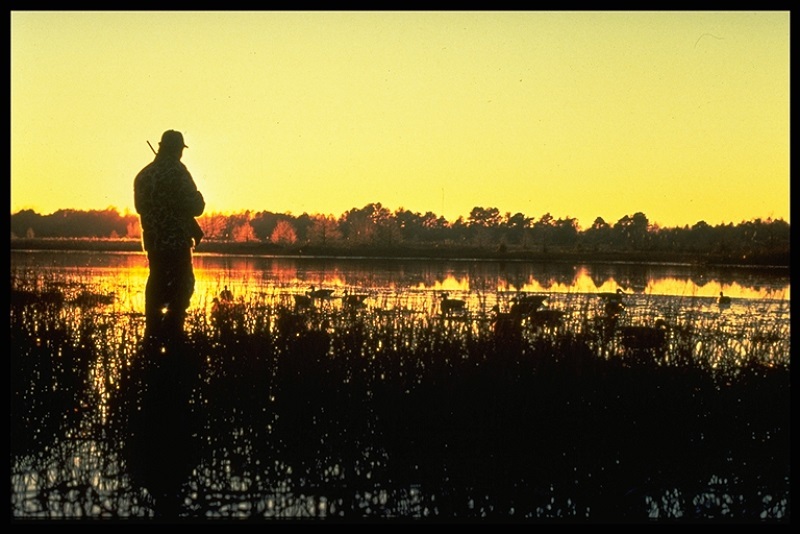 Being a HIP certified waterfowl hunter isn’t just a good idea—it’s the law. 11—Officially it is a requirement by law that every individual that plans on hunting migratory birds in the state of Texas us HIP certified. If you are not HIP certified and you are hunting migratory game birds, you are subject to game violations. Become HIP certified; find information on the Texas Parks and Wildlife website. Bumblebees are the bomb—or per their genus: bombus. Texas has nine native species of this big, slow-flying, black and yellow insect. 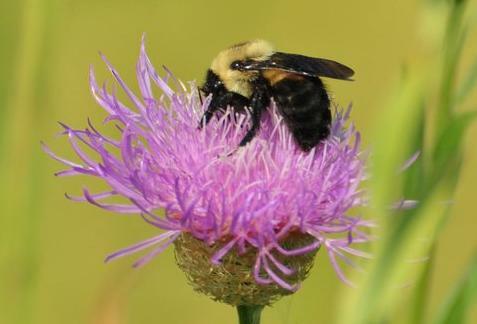 They’re effective pollinators of our native plant species, and many food crops, too. This is the time of year when they start to wind down. 18— At the end of the summer, the queen that started the colony gives birth to new queens. The old queen dies and all her workers die. But the new queens mate, find a hole in the ground, spend the winter there, come back out in the spring, and she starts a whole new colony. Michael Warriner… an invertebrate biologist with Texas Parks and Wildlife… tells us how this queen bee does it. 36— In early spring—February and March—the new queen comes out, and she’s foraging. [She] finds a nest site, and she starts making what’s called a “honey pot.” It’s a little waxen thimble, and she fills that with food. Then she accumulates pollen and makes a big pollen ball. Then she lays eggs, and she stays there [tending to the nest and larvae tht hatch]. And those are her first workers. Once her first worker daughters mature, she stays there [in the nest] full time—her main business is laying eggs. But, getting started is pretty much all on her: getting all the food and having the reserves to stay put and raise that first batch [of young]. Learn more about Texas Bumblebees at Texasbumblebees.com.